The Nocona Public Library is located at 10 Cooke Street. One block East of Clay Street and one block North of Highway 82. Visit us to see all that we have to offer....we are more than just books! The Nocona Public Library was founded on October 20, 1972. A small building on the Chevrolet dealership lot on Cooke Street was donated by Jim Hogue to house the library. Mrs. Audrey Mitchell was elected to set up and operate the library for the first year. By May 1973, the library had reached a circulation of 250. The building on the car lot was no longer big enough for over 300 patrons and the wide variety of books, so a search began for a larger building. In August of 1973 the library moved to a new location, which was a part of the Sears building at 111 East Oak Street. On March 15, 1974, Mrs. Don Vickery became the librarian for a few short months. In September of that same year, Mrs. Jimmy Nix took over as librarian. For 12 years, Miss Addington saw the library through many growing pains until she retired on October 31, 1987. Some of the other librarians or directors include Travis Cargill, Dan Poole, Mary Norman, Alicia Walker, Jayne McCall and currently, Karen Teague. In January of 1979, Mr. and Mrs. Earl Nunneley deeded the City of Nocona the land where the present library is located. The Nunneleys generously gave this lot to the citizens of Nocona. Within three years our current building was built. On August 24, 1982, it was dedicated by Mayor Lynn Roberts. The Board of Directors for the new building were Chairman Jerry Johnson, Mildred Nunneley, Robert Fenoglio, Lelia Scott, Jack McGaughey, Rosemary Wingate, James Oldham, Joan Coleman, and Harold Lawrence. The librarian, at the time, was Miss Addington. The library is located at 10 Cooke Street, right off Highway 82 near the Nocona City Hall and Police Department. Our building is 4,980 square feet. It includes an entrance way, the main lobby, an office area, a conference room, two small storage rooms a cleaning closet and two restrooms. The library is open Monday through Friday, 9 am to 5:30 pm. The Library's current collection consists of more than 25,000 items. Our collection includes books for all ages, e-books, newspapers, and magazines. A large section of the books are fiction for one's reading pleasure. The library has a non-fiction section that is full of facts and information. Nocona Public Library also has audio books and movies available for patron checkout. 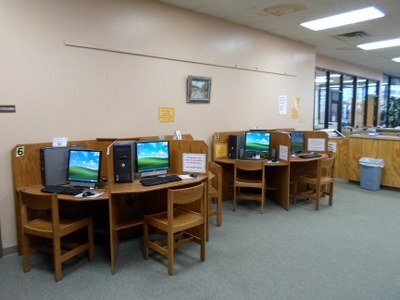 There are computers available daily for public use. A recent addition to the technology section is WiFi. WiFi allows our patrons to bring their own device in and connect to the internet free of charge. Another new addition to the library is the genealogy section. We have a computer designated just for ancestry research. We have ancestry.com available for those who are interested in looking for ancestors. 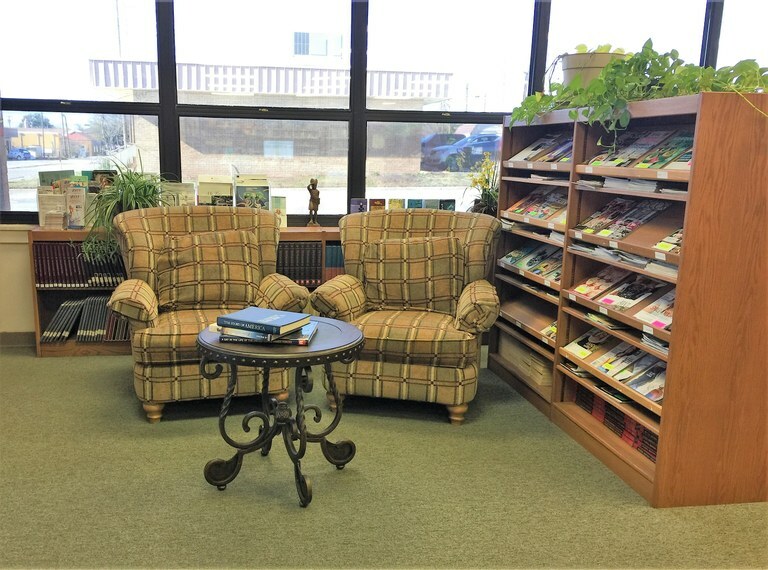 The library receives the Wichita Falls Times and Record News daily, as well as The Nocona News weekly and The Bowie News, bi-weekly. Old editions of the Nocona News are available on microfilm for those needing to find an old article. We also receive several magazines for reading pleasure. The library staff can make copies and send and receive faxes for the public for a small fee. The library has a conference room that is available to the public for meetings free of charge. This room is available by reservation only, and reservations are at the discretion of the library staff. Nocona Public Library offers a summer reading program for children of all ages. We offer story time for children on Mondays at 11:00 am, year around. The library will deliver books or other library material to shut-ins. It is our way of helping everyone use the library. Some local artists have artwork on display in the main lobby. We have a locked display case available to anyone who would like to share a collection of things of interest. 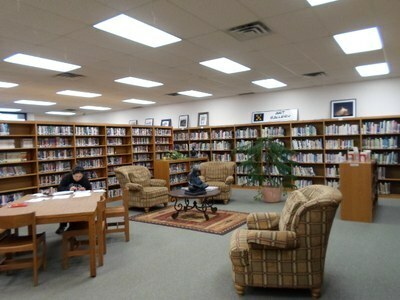 The Nocona Public Library has a Friends of the Library group. This group has fund raisers throughout the year to benefit our library. Nocona is located on U.S. Highway 82, nine mile north of Montague in North Central Montague County. According to the 2012 census, Nocona has a population of 3002. Our town was named for the Comanche Chief, Peta Nocona. This North Central Texas community is located in an area with a rich and colorful history. Our part of North Texas known as Red River Station was the major camping and feeding grounds known for the Longhorn cattle headed north on the famous Chisholm Trail. From the Oil Boom discovery days in 1922 to being the Leathergoods Center of North Texas, Nocona has seen and been a part of it all. Nocona is the long-time home and birthplace of Nocona Boots, one of the most famous names in cowboy boots. The tradition of boot making lives on with Fenoglio Boot Company, which proudly maintains our 100 plus year old reputation of quality cowboy boot craftsmanship. Nocona remains the center for national and international leathergood companies such as American Original Ball Glove Company. This company is an industry leader in football, baseball and sports safety equipment. While the leathergoods industry is still a mainstay in Nocona's economics and employment, our cattle, oil, heavy equipment sales, farming and ranching industries are always a major part of the Nocona lifestyle.